In the 1930s Japan’s statesmen and military leaders in China were acutely aware that their eco­nomy and armed forces were depend­ent on im­ports from the United States and its colo­nial friends who had holdings in the Asia Pacific region: the Amer­i­cans in the Philip­pines, the Brit­ish in Malaya (now Malay­sia), the French in Indo­china (now Viet­nam, Laos, and Cam­bo­dia), and the Dutch in the East Indies (now Indo­ne­sia). The Japa­nese im­ported prac­ti­cally every basic material they used in processing or manu­facturing items for domestic con­sump­tion, much of it from a geo­graphi­cal area in which they felt they should domi­nate. Imports included most metals, rubber, and food, including the house­hold staple rice. The U.S. supplied roughly 80 per­cent of Japan’s oil needs. Aside from 2.7 mil­lion barrels pro­duced domes­tically (about a day’s worth of U.S. produc­tion), Japan prin­cipally met the rest of its fuel needs by imports from the oil-rich islands around the Java Sea—Borneo, Suma­tra, and the Dutch East Indies—aug­mented by com­para­tively paltry imports from Japanese-occupied Korea, Manc­huria (Man­chu­kuo), and Formosa (Taiwan), Soviet Sakhalin, and Mexico. Wash­ing­ton clearly under­stood Japan’s utter depen­dence on oil and other over­seas resources for its economic security. The State Department arranged for three pas­sen­ger liners to sail to Yo­ko­ha­ma and Kobe, Japan, as well as to the Chinese ports of Shang­hai and Chin­wang­tao (Qin­huang­dao, 160 miles east of Beijing) to repa­tri­ate Amer­icans. A State Depart­ment em­ployee wrote in his diary following the news that Japan had joined with Germany and Italy in the Tri­par­tite Pact, which was a ten-year mili­tary and eco­no­mic agree­ment signed on Septem­ber 27, 1940, that Japan hoped to use it as a bar­gaining chip with America: “And so we go—more and more—farther and farther along the road to war. But we are not ready to fight any war now—to say nothing of a war on two oceans at once.” Ready or not, war came to America on Decem­ber 7, 1941, with the most “unfriendly act” of all—the Japa­nese sur­prise attack on U.S. naval and army air bases at Pearl Harbor, Hawaii. 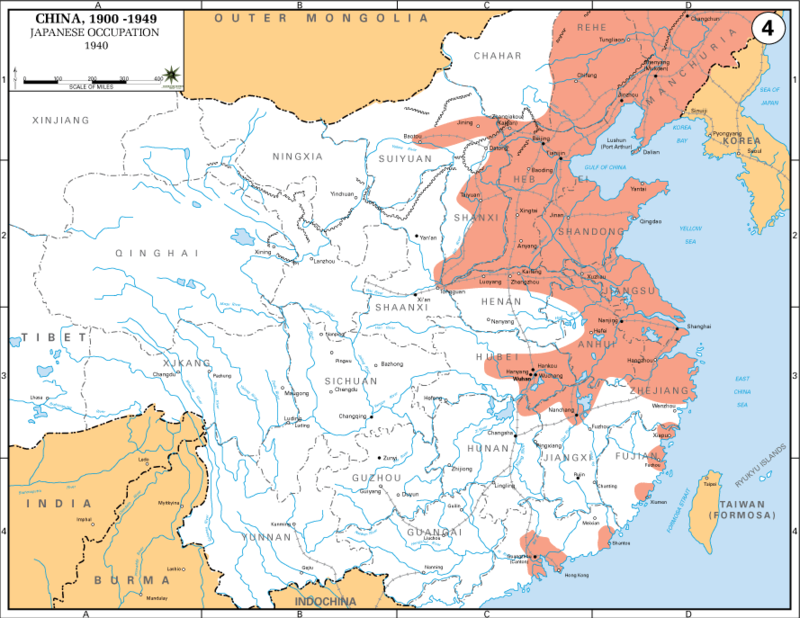 Above: Map of China, 1940, showing the extent of Japa­nese expan­sionism (in bur­gundy). Japan seized Taiwan in 1895, declared Korea an imperial protec­torate in 1905, and invaded Manchuria (Manchukuo) in 1931. Left: Japanese cavalry entering Mukden (Shenyang), Man­churia, Septem­ber 18, 1931. Japan’s Kwan­tung Army on the Chi­nese main­land fabri­cated a bombing inci­dent on a tiny por­tion of the Japa­nese-owned South Man­chu­ria Rail­way as a pre­text to occupy Man­chu­ria, a pro­vince semi-inde­pendent of China, and other areas in North­eastern China. Both locations were rich in mine­ral and agricul­tural resources. Most West­erners believed the “Muk­den Inci­dent” (aka “Manchurian Incident”), although coming on top of other Sino-Japa­nese inci­dents, was way over­blown and should not have led to Japan’s take­over of Man­chu­ria, where the Japa­nese installed a puppet government in a “state” they named Manchukuo. Right: Manchukuo became the spring­board for further Japa­nese aggres­sion in China. Out­lying pro­vinces were annexed into Man­chu­kuo or turned into buffer zones, effec­tively under Japa­nese occu­pa­tion. 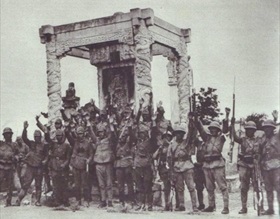 By the start of 1937 all the areas north, east, and west of the large Chin­ese city of Bei­jing were con­trolled by Japan. On July 7–8, 1937, the Japa­nese pro­voked an­other “inci­dent” at the eleven-arch granite Marco Polo Bridge 12 miles south­west Beijing, as well as at a railroad bridge to the southeast of the city. Above: The heightened tensions of the Marco Polo bridge inci­dent led directly to Japan’s full-scale inva­sion of China in the Second Sino-Japa­nese War (1937–1945), begin­ning with the Battle of Bei­jing-Tianjin (early July to early August 1937) and the Battle of Shang­hai (August 13 to Novem­ber 26, 1937). 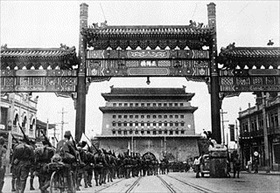 In the photo on the left Japa­nese troops are shown passing from Bei­jing into the Tar­tar City through Chen-men, the main gate leading to the palaces in the For­bidden City, some­time in mid-August 1937. 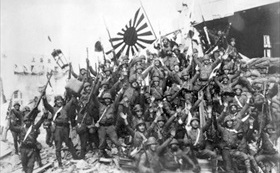 In the photo on the right Japa­nese marines cele­brate their success­ful landing near Shang­hai that same month. 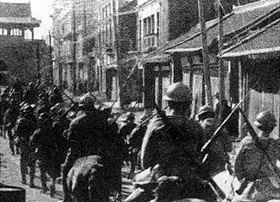 Approx­i­mately 200,000 Chi­nese and 70,000 Japa­nese died during Japan’s three-month attempt to take Shanghai.